There's been a lot of controversy over Microsoft's decision to force updates on Windows 10 users. There are both good and bad things when it comes to automatic updates. For instance, automatic updates make sure that your system is up to date with security fixes. Moreover, you'll get access to new features as they are released. Like I said there are disadvantages too. Just recently, the new October 2019 update deleted user files. Microsoft had to stop the October update rollout and fix the issue. Fortunately, this didn't happen to me and the update went pretty smooth. Though Windows 10 has no options in the Settings app to stop automatic updates, you can disable automatic updates quite easily using different workarounds. Here's how. Create a system restore point before making any big changes to your system. 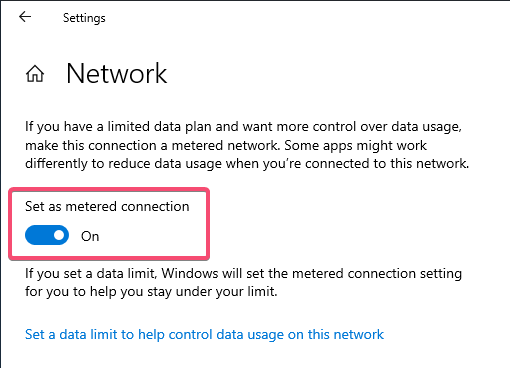 The easiest way to stop automatic updates in Windows 10 is to turn on the metered connection for your network in the Settings app. 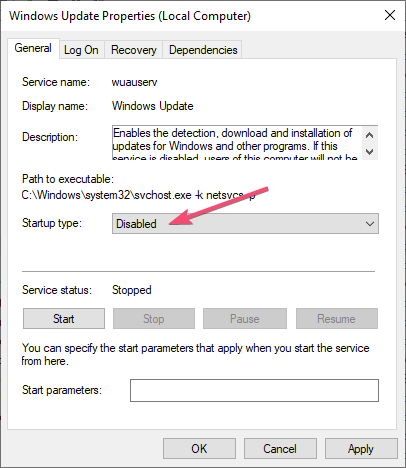 Once you enable metered connection setting, Windows 10 will not download updates automatically so as to save the data. Obvious, isn't it. The benefit of using this method is that it is easy to configure. i.e. you can quickly enable and stop automatic updates with a single click. 1. Open Settings app and go to "Network and Internet" page. If you are using an Ethernet connection, select "Ethernet" from the left panel. If you are using Wi-Fi, select "Wi-Fi" from the left panel. Now, click on the active "Network" icon. 2. Now, scroll down and toggle the switch under "Set as metered connection" to "On" position. That's it. From now on, Windows will not download automatic updates. When you want to resume automatic updates, simply toggle the switch back to "Off" position. When you turn on the metered connection, you can also set data limit. This is quite helpful if you are using mobile data. Setting data limit on metered connection limits all Windows activities. For instance, on a limited connection Store apps won't update automatically and OneDrive won't sync files unless you do it manually. 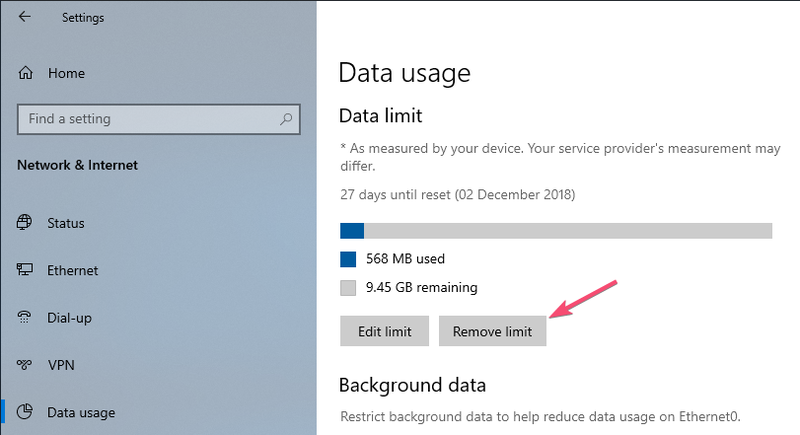 Simply put, setting data limit will further restrict Windows from automatically downloading stuff in the background. 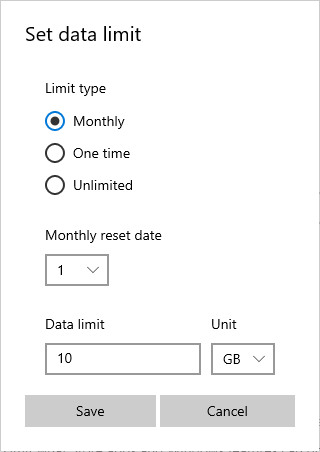 If you would like to set a data limit on your current connection, click on the "Set a data limit to help control data usage on this network" link in the Network Properties page (see step 2). Now, select your network from the drop-down menu and click on the "Set limit" button. Select the limit type, monthly reset date, overall data limit and hit the save button. You've set the data limit successfully. To remove the limit, simply hit the "Remove limit". To download updates in the background and perform other update related tasks, Windows 10 has a special service called Windows Update Service. By stopping the Windows Update service, you can stop automatic updates. This method is particularly useful if you don't want to set your connection as a metered connection. Just like the metered connection settings, stopping Windows Update Service is pretty easy. 1. 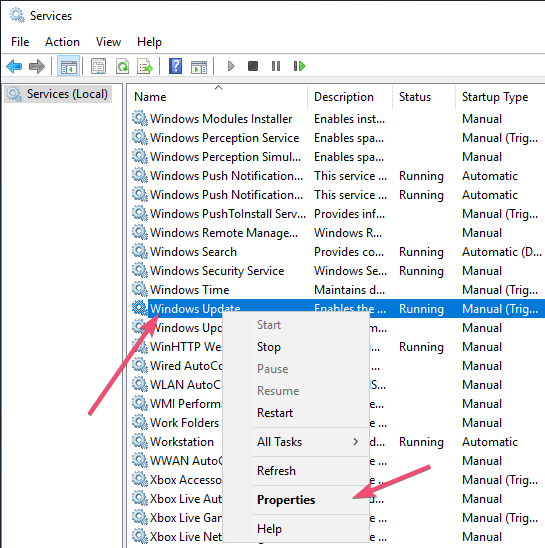 Open run dialog box by pressing the keyboard shortcut Win + R. Type "services.msc" in the blank field and click on the "Ok" button to launch Windows Services window. 2. Windows Services module is where you will find all the Windows services regardless of their state. 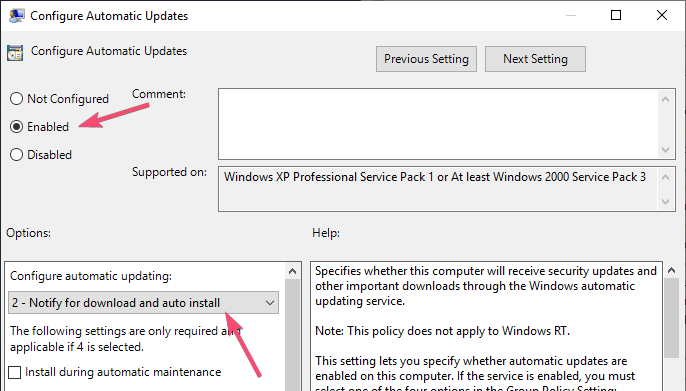 Scroll all the way to the bottom, find "Windows Update" service, right-click on it and select "Properties" option. 3. 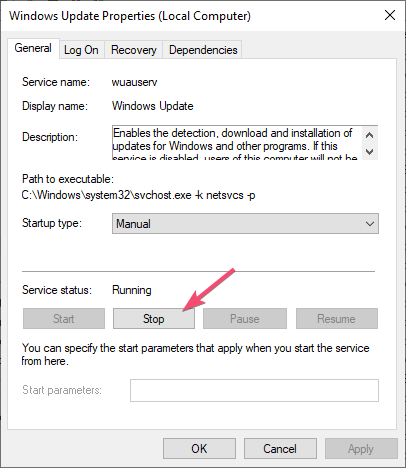 In the Windows Update service properties window, click on the "Stop" button under the "Service status" section. 4. Next, select "Disabled" from the drop-down menu next to "Startup type". 5. Even though you've disabled the Windows Update service, Windows may still try to start it automatically under certain circumstances. To avoid that, go to "Recovery" tab and select "Take No Action" from the drop-down menu next to "First failure". 6. Click on the "Apply" and "Ok" button to save changes. That's it. Since you've stopped Windows Update service, Windows 10 will no longer automatically download updates. Do keep in mind that stopping Windows Update service may cause problems with applications that use Windows Update Agent (WUA) API. But, those kinds of applications are few and far between. Moreover, general Windows users won't encounter those kinds of apps. If some app is not working as it should or if you want to revert back to the default configuration, go back to step 4 and select "Automatic" from the drop-down menu. 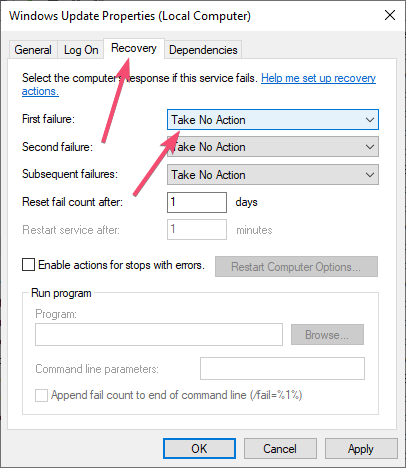 Next, go to the Recovery tab and select "Restart the service" from the drop-down menu next to "First failure". You can also disable automatic updates in Windows 10 by changing a single Group Policy setting. The benefit of this method is that it gives you more control over how Windows downloads the automatic update. This method is quite useful for system administrators who manage multiple systems. Though the Group Policy method is quite easy to follow, Group Policy Editor is only available for Windows 10 Pro users. If you are using Windows 10 Home version then use the top two methods or follow the registry method below. 1. To change the group policy settings, you need to access Group Policy Editor. For that press Win + R to open the run dialog box, type "gpedit.msc" in the blank field and press Enter. 2. Once the Group Policy Editor has been opened, go to the following location. 3. 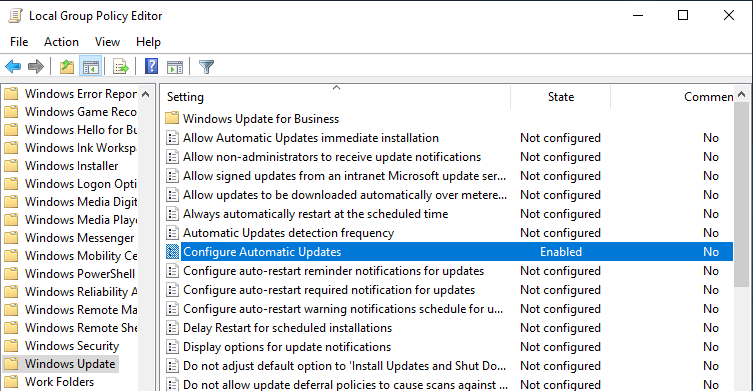 On the right-panel, find and double-click on the "Configure Automatic Updates" policy to open its properties. 4. In the policy properties window, select "Enabled" option. Under the Options category, select "2 – Notify for download and auto install" under Configure automatic updating section. Click on the "Apply" and "Ok" buttons to save the changes. Restart your system to apply the policy settings to your system. Unless you restart the system, the policy settings won't be applied to your system. What this option does is that it will notify you of any available updates. Only after you manually choose to install the updates, Windows 10 will download and install the updates. To download the updates, simply open the Settings app and go to "Update and Security -> Windows Update". To revert back to the default behavior and download automatic updates, go to step 4 and select the option "Not configured" or "Disabled" and save the changes. Since Windows 10 Home users don't have access to the Group Policy Editor, you can use the registry editor to stop automatic updates. In the registry editor, you need to create a couple of keys and values to disable automatic updates. One should always be careful when editing or modifying the registry. So, before making any changes backup registry so that you can restore it to its default state if things go wrong. I've already created the registry keys and values for you. 1. Download Notify for download and auto install reg key, extract it from the zip file and save it on your desktop. Quick tip: you can open the .reg file with Notepad and see what's in it. 2. Double-click on the downloaded .reg file. If you see a UAC (User Access Control) prompt, click "Yes". 3. Next click "Yes" and "Ok" buttons respectively to apply the changes and merge registry settings. That's it. You've successfully stopped automatic updates using the registry. If you want to revert the settings, download enable automatic updates reg file and follow the steps 2 and 3. In general, I encourage you to let Windows update automatically for better security, bug fixes, and new features. But if you are facing problems with Windows 10 automatic updates then following the above methods should effectively stop those automatic updates. Sure, they are workarounds for what should be a readily available option in the Settings app. However, the methods work as they should. So, there shouldn't be any problems. Hope that helps. Comment below if you face any problems and any bad experiences with Windows 10 automatic updates.